"“Tipped off by protests against soaring fuel prices, I landed in Yangon on 23 September, 2007, with some old clothes, a Canon 5D camera, two fixed lenses and a laptop," writes Adrees Latif in his blog post. "...Knowing that hundreds of people were gunned down in similar circumstances in a 1988 uprising, I climbed an old crosswalk directly overhead, to get to one of the few spots offering a clear view... I had already locked on my 135mm lens and set my camera shutter speed to 1000, aperture to F/7.1 and ISO at 800. With the camera on manual, I wanted to stop any movement while offering as much depth-of-field as possible." This is a fascinating account that is worth reading for anyone interested in great photojournalism. We heard about the ColorMunki Photo ($449 on Amazon.com) earlier this year at PMA. But now that the real product is shipping, the reviews are starting to surface. "ColorMunki Photo is a brand new colour management device that makers X-Rite are touting as a "breakthrough product". What's the reason for all the excitement? Namely price - ColorMunki Photo offers monitor, projector, and printer profiling at the previously unheard of price of $499 / £379 / 429 Euros, seemingly without cutting any corners. Our colour management expert Jon Canfield has been testing the ColorMunki for the last few months - find out if it meets all those high expectations in our latest review..."
I can tell you right now, Jon likes it. And so do others I've talked to. If you've been waiting for the next big thing in color management, this might be it. The name is funny, but the results seem quite serious. If you missed my first live webinar, "Five Ways to Impact," you can now download the entire presentation from the O'Reilly Media site. The 54-minute presentation shows five techniques for making your pictures look better than others, plus includes a Q&A session with queries submitted live from the audience. You'll need some bandwidth, however, because this puppy is really a big dog at 175 MBs. It does have quick start, so the movie begins playing before the download is complete. To view, go to -- http://downloads.oreilly.com/oreilly/videos/oreilly-story-webcast.mov -- then put your feet up and enjoy. "This image is a culmination of approximately 35 images taken from a small street near a busy freeway interchange," said Sage Humphries D.D.S. "I originally got the idea when changing from one So Cal freeway to another in traffic. As I was gazing down upon the busy interchange from high above, I was amazed at the aerial view and really wanted to try and replicate the complexity of the interchange without the chaos of the cars." "I knew that I could not set up a tripod and a camera at this location of inspiration, and I knew there was no way to shoot a Southern California freeway without any cars during daylight hours. I was aware of the stacks feature released in Photoshop CS3, so I scouted out another interchange, with a descent vantage point, and decided to give it a try." "Originally 75 images were taken on a tripod to ensure that enough data was obtained. The photos were captured using a Canon 5D with a 24-105mm EF f/4 lens at ISO 100, shutter 1/400 sec, and f/5.0. After taking the shots, they were imported into lightroom and I selected 32 of the images and opened them in Photoshop CS3. In PS I utilized the median stacks feature to remove all of the cars. It took PS some time to crunch down the stack (especially with auto align selected: my tripod is not too stable), but once finished, I had an image without any cars (well I had one but that was easy enough to clone out). From here I removed a few distracting background elements and added a black and white adjustment layer." 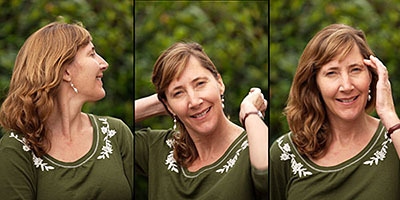 "I know that there are probably a lot of people out there using this feature of PS CS3, but I figured that it may be something new to some of the virtual camera club members. I see a lot of potential for this feature. Think how many times you wanted to take a photo of a popular site but could not capture the image without distracting background or foreground elements." "The day I shot this particular photo was a pretty cloudy day and in retrospect I might have increased my ISO a little so I could increase the shutter speed and minimize blurring in the cars. This would have probably helped eliminate the ghosting of the last car after the stacking." 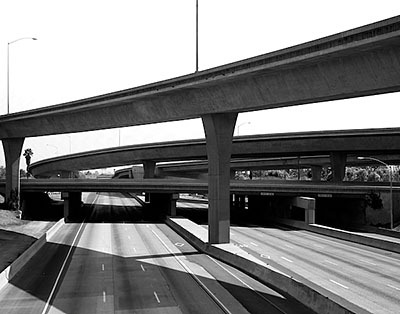 Photo of the No Car Freeway by Sage Humphries. Tom Hogarty, Adobe Photoshop Lightroom Product Manager, took the stage in Orlando and showed off some of the new features in the beta release of Lightroom 2.0. Existing users of Lightroom 1 can get the beta today by visiting Adobe Labs and clicking on the download link. Adobe states on the Labs page: "The Lightroom 2.0 beta program is available for use by all current Lightroom customers. If you don't already own a copy of Lightroom you can download the beta and try it for thirty days. If thirty days is not enough time, Lightroom customers can invite friends to try the beta with them for the full length of the program." Tom demoed some slick metadata tricks, improved integration with Photoshop, print module additions, and new selective editing tools that allow you to easily work on specific areas of your image. 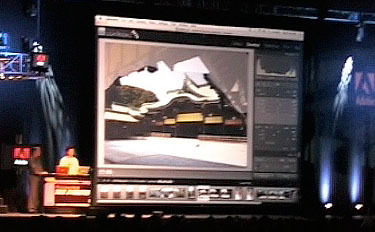 In Lightroom 2, photographers can use brushes for dodging, burning, and other adjustments giving them greater control than possible with global adjustments. You can watch a 3-minute movie of Tom Hogarty demoing Lightroom 2 where here shows off the new dodge and burn tools. Overall, the response was enthusiastic to the selection tools. If you download the Lightroom 2 beta and want to report your experiences, please post a comment here. Inside Anecdotes from the Making of "Digital Photography Principles"
Lynda.com just announced the release of my latest title, Digital Photography Principles: The Camera. And they've made 14 movies from the title available for free. That's more than 40 minutes of instruction that you can go watch right now. I hope you check them out, because they are useful and fun. But what I really want to talk about today is how we made this movie. I think it's a real departure from what you normally see on Lynda. First of all, this isn't your standard screencast type training. As I mentioned in an earlier post, we were able to use Samy's Camera in Santa Barbara as the set for many of our live action movies. It's quite fun having the run of a camera store after hours. During the shoot in Samy's, they lost some of the B-roll footage that showed the close-up shots of equipment that I was explaining. To compensate for this, the next day they photographed every piece of equipment I discussed in the Chapter 13 movies in the Ventura studio, then inserted the stills where the B-roll was supposed to go. The upshot? I think the still photos work better than the B-roll would have. It was more work, but in the end the viewer benefits. Then, for other pieces, such as discussing flash mode options, we connected digital cameras via their video output jacks to the recorder. Doing this allowed us to show in real time the various camera menus just like you'd see them on you LCD. I wanted pretty backgrounds while demonstrating the function controls that show the live image as you made adjustments, so I rigged up a light booth and focused the camera on mounted photographs while I discussed the controls. You can see an example of this technique above. The picture of the cruise ship is a mounted photo in my rigged-up light booth. I have a camera on a tripod (Sony T200) with a live histogram showing on the LCD. We took the video feed off the LCD from the camera and plugged it into our recorder. Meanwhile, I'm in a closed sound booth with controlled audio to make sure my voice comes across clean and clear. As I said, this isn't your standard Lynda.com training. We also did fun stuff such as going to a mountain top to shoot a panorama, recorded live face detection demos in the lobby of Lynda.com, and even visited a parking garage to talk about the usefulness of mobile devices. My favorite part in the parking garage is where they shoot me teaching through the back-up video camera on a Toyota Prius. Yeah, that's me behind the Toyota. Here's another fun insider story. I mentioned the panorama movie earlier shot on a mountain top. Well, the wind was really whipping that day, as you can see by my tussled hair. There was no way we could capture clean audio. But we really wanted to keep this piece in the title. So our solution was to make a written transcript of my monologue on the mountain top, then send it to me after I had returned home. I went into the Digital Story podcasting studio and read the transcript while watching the video. I sent my new audio back to Lynda headquarters in Ventura, and they synced up the studio audio with the video. If you watch closely, you'll notice it's a little like a dubbed Japanese horror flick. But it's also fun. I'm really glad we kept the panorama piece in the title. There's plenty of other goofy stuff too, but I think you get the idea. 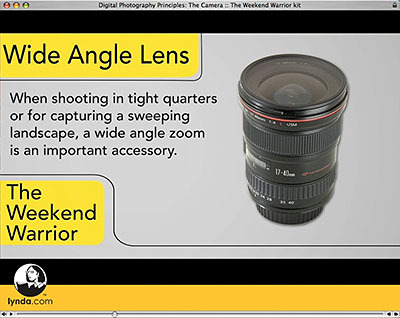 When it's all said and done, Digital Photography Principles: The Camera will help lots and lots of people master their camera and take better photos. It's the first installment of a trilogy. I'll be heading down south soon to begin work on the second title. Stay tuned. Lots of reader mail has been flowing in lately, and a few of the questions have me stumped. 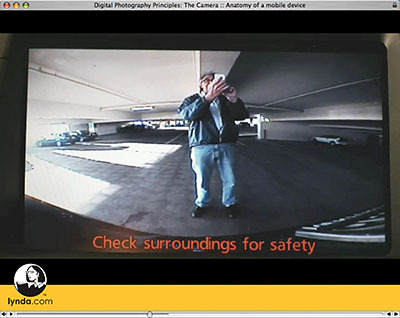 So I thought I'd occasionally run one or two by our adept virtual camera club members to see if anyone has an answer. Dale writes: "I've been using burst mode on my D300 and noticed something odd that perhaps you could comment on. Whenever I shoot in burst mode I find that the camera records the images slightly out of order." "For a portrait session, that wouldn't matter of course, but for sports it's a little annoying because I like to have the images in the correct order when I view them on the LCD or in software later." "For example, when I shoot basketball games, a player might be going up for a lay up, and in the next image, he or she is still driving to the basket. I sometimes will delete images during timeouts, and it's very disconcerting to have the images out of order. Perhaps this is a minor thing, but it sure would be helpful to have them in the correct sequence." "Have you experienced this or know any solutions?" Dale, I haven't shot much with a D300 (though would like to), so I don't know what is going on here. But hopefully a few of our readers will have some idea of what may be causing this. Please post a comment if you think you have an answer... or something interesting to add. I'm heading out to Photoshop World this week, and I should have lots to report. First, I'll be recording interviews in the O'Reilly Media booth with some great photographers including: John Paul Caponigro, Vincent Versace, and Stephen Johnson. I'm also going to chat with Mikkel Aaland live from Tasmania via AIM as he reports on the Lightroom Adventure II from way down under. 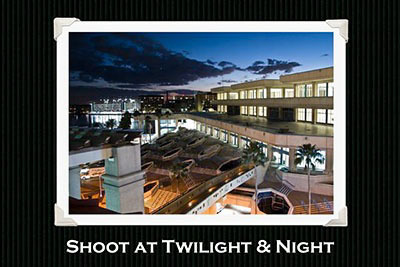 During my stay in Orlando, I'll also promote my new book, The Digital Photography Companion. O'Reilly Media, the publisher, is giving away Photo Companion Cards that I designed, which include tables for exposure compensation, lighting, white balance settings (with Kelvin), and an "After Every Shoot" checklist. The cards look just like the tables in the back of Companion, so if your attending Photoshop World, be sure to come by the O'Reilly booth and get your hands on one. Can't wait to grab a few myself. If anything hot catches my attention while I'm in Orlando, I'll post here about it. Otherwise, stay tuned for some terrific audio interviews coming your way. 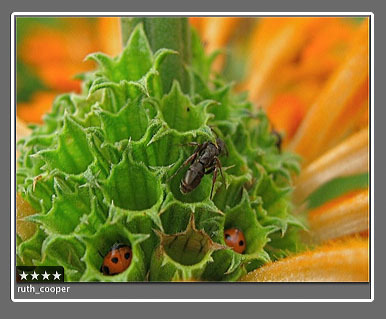 There's so much to like about Aperture 2.1, but the game-changer is Edit API. Apple has created a bonafide plug-in architecture for Aperture that enables 3rd party developers such as Nik Software (Viveza) and PictureCode (Noise Ninja) to place their technology within Apple's pro level photo management application. In order to give you a glimpse at the possibilities, Apple is providing the first plug-in for free and part of the 2.1 download. 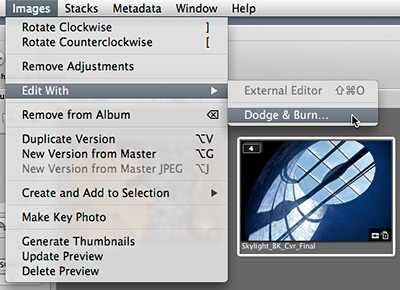 Dodge and Burn works just like tools in your favorite external editor, except you don't have to go anywhere. Consider it your "internal editor" that provides very elegant tools for lightening and darkening specific areas of a photo. But wait, there's more. Go to the popup menu in the interface and you'll also see options for saturate, desaturate, sharpen, blur, contrast and fade. This is one heck of an example plug-in. The file handling is similar to roundtripping with an external editor. You choose an image in your library to edit, Aperture opens it in the plug-in window, your make your adjustments, then when you save, a new master Tiff is placed in your Aperture library. As always, your original file remains safe. And, if that original is located on an external drive, the new edited plug-in Tiff will be stored there too. Tablet users will really enjoy this editing experience. Dodge and Burn is fully tablet compliant. This means you can work quickly and accurately with a pressure sensitive pen. And if you're a custom keystroke kind of dude, you can set your own combination for any of the plug-ins enabling one-touch activation. 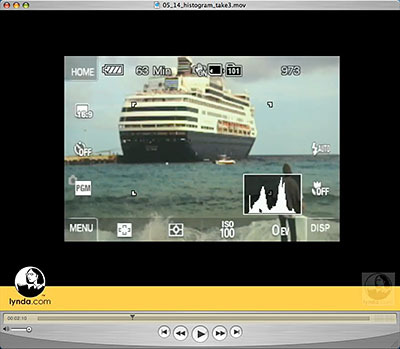 Developers interested in creating plug-ins for Aperture will be happy to read that the SDK will be available soon. You can find out more by contacting aperturedeveloper@apple.com. In the meantime, enjoy using Dodge and Burn. It's a much welcomed addition to the Aperture toolset. I attended the San Francisco stop of the Aperture World Tour today and had the opportunity to listen to New York pro shooter David Bergman talk about his workflow. This is a guy who sometimes captures as many as 4,000 Raw images in a single assignment. Since a hobby of mine is appreciating the different ways photographers apply star ratings in their photo management applications, I thought I might pass along David's approach. He starts by going through the entire shoot once applying either a single star on no star to every picture. If a shot gets a single star, it's a legitimate photograph. It might not be a winner, but the focus, exposure, and composition are acceptable. If an image doesn't get a star, then it will most likely never be used. David then sorts the images, and goes back through the one star images. This time, he looks at them a bit closer, and applies two stars to the pictures that he thinks have potential. He then makes one more pass, this time through the two star images, and applies three stars to the handful of keepers from the shoot. These will be the photos that he will perfect and pass along to the client. What about four and five stars? David says that four stars are reserved for portfolio pieces, and it's very rare that he would rate an image five stars unless he felt is was a true hero shot. I know my approach to rating has changed over the years. I thought you might enjoy reading this approach by a big time shooter.